A new game Trivia comes to the app store from the hand of Appbusso developers. This time we present Higher or Lower, a classic game where you will have to guess which word has had more searches during the past year 2018. 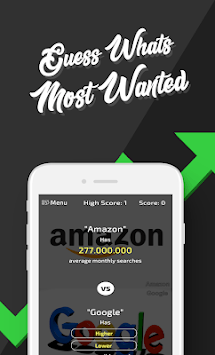 🥇 Do you think you can get the highest score? There are more than 1500 different words, so you will have to apply your ingenuity and think if words like "Battle Royale" has been searched more than "Make money on the Internet", for example. We've read all your comments and knew you were looking for a version of High or Low, with updated questions to 2019📋, current topics and search trends. That's why we can assure you that this new Trivia will guarantee you hundreds of hours of fun, being able to compete for the number one position in the ranking of scores against friends and family. 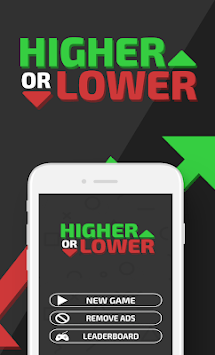 The High or Low is designed for both young and old, as it is a simple game and easy to play, where applying a little logic and sharpening the ingenuity, you will have to know which keyword shown on the screen has been most searched on Google over the past year. In short, this is an ideal question and answer game to kill time when you are bored, whether you are on the bus, at school break or even as a game to use in leisure time as challenges and challenges with friends. Without a doubt, High or Low offers many hours of fun and has been played by millions of youtubers from 2016 until today. If you would like to make a suggestion about the game, you can use the email below to give us your feedback. Help us to keep improving by leaving your feedback and comments - we read you!